it is unrevealed whether there were others aboard the ship, but no one else exited the ship before it exploded. (Epic Illustrated#1/15 (fb) - BTS) - In 1980, the Zygotean armada assaulted Earth, pounding away at its defenses. Almost every major country --except Great Britain -- was attacked, and Earth's most powerful technological weaponry proved itself useless against the aliens. (Epic Illustrated#1/15) - In Covert, Kansas, as a family discussed the current crisis, a Zygotean mercenary ship arrived and blew up the house, killing the mother (Laurie), father (Frank), and grandfather ("Pops"), but sparing the daughter, Juliet, who was sulking on their lawn. Zygotean landing party 017 (a pair of Zygotean mercenaries, including Captain Guolabou and an unidentified warrior) exited the ship, reported their securing of the coordinates and instructed the fuel fleet to be brought in. The party leader felt this location would make an excellent landing depot due to its level terrain, superb atmospheric conditions for visibility and...< Guolabou was interrupted by his warrior who pointed out a human survivor>. Guolabou instucted his warrior to eliminate her, but before it could, Aknaton (an Osirosian leading a plot to save the universe from the Zygoteans) destroyed the warrior with an energy blast. On Aknaton's order, his ally, Za, picked up Juliet and backed off, but Guolabou struck swiftly, nailing Aknaton twice with his handblaster before Aknaton obliterated the mercenary (and presumably his ship, as well). Comments: Created by Jim Starlin. Captain Guolabou was a a Deltian, native to planet Delta-7, presumably the seventh planet in the Delta star system, Milky Way galaxy, Reality-8116; his people were known for being able to fire their weapons swiftly, although they were not known to be extremely accurate. He led Zygotean landing party 017 in a mission to investigate Covert, Kansas as a potential landing depot. As their ship arrived, it blew up the house of Laurie and Frank, killing them both as well as "Pops," although their daughter, Juliet, was outside the house and thus survived. After Captain Guolabou and an unidentified warrior exited the ship, Guolabou reported their securing of the coordinates and instructed the fuel fleet to be brought in. Guolabou further noted that this location would make an excellent landing depot due to its level terrain, superb atmospheric conditions for visibility and...< Guolabou was interrupted by his warrior who pointed out a human survivor>. With surprise, Guolabou noted the presence of an Orsirosian, and when Aknaton instructed his ally Za to take Juliet to safety as he and the Zygotean mercenary had matters to settle. Guolabou agreed, "Indeed we do...you pulsar-sucking obstructionist!" as he fired a pair of energy blasts from his hand weaponthat struck Aknaton in the head and left shoulder. Clearly pained, Aknaton noted he had forgotten how quick are "you jackals from Delta-7," but then -- as he fired an energy blast that obliterated both Guolabou and apparently his ship -- added, "fortunately, your aim is also typically Deltian, pathetic." 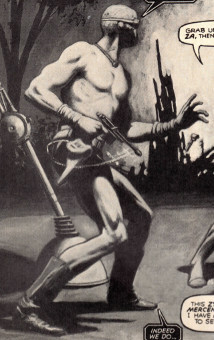 Almost nothing is known of the warrior, other than that he served under the Zygoteans, and specifically, one of their mercenaries, Captain Guolabou, in Zygotean Landing Party 017. It is unclear whether the warrior was also a mercenary, or whether he was a member of one of the races subjugated by the Zygoteans. (Epic Illustrated#1: Metamorphosis Odyssey chapter III: Juliet - BTS) - He was party of Zygotean landing party 017 in a mission to investigate Covert, Kansas as a potential landing depot. (Epic Illustrated#1: Metamorphosis Odyssey chapter III: Juliet) - Exiting the ship alongside Guolabou, the warrior noted the presence of a human survivor, Juliet. Guolabou instucted his warrior to eliminate her, and the warrior acknowledged "yes, sir, immediately," but before it could, Aknaton (an Osirosian leading a plot to save the universe from the Zygoteans) destroyed the warrior with an energy blast. Note: Honestly, I think we would assume that the warrior is a male, but we don't know that for sure. 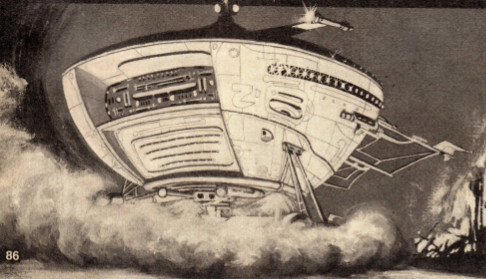 This ship brought Zygotean landing party 017 in a mission to investigate Covert, Kansas as a potential landing depot. It carried Captain Guolabou and an unidentified warrior, at least. As it approached, it blew up the house of Laurie and Frank, killing them both as well as "Pops," although their daughter, Juliet, was outside the house and thus survived. After Guolabou and the warrior exited the ship, they got into a skirmish with Aknaton of Orsiros, who destroyed the warrior and then Guolabou and the ship.